The unfinished Building 8 n Base Village, once planned to operate as a Little Nell Snowmass hotel, now proposed to be sold as time share condos. 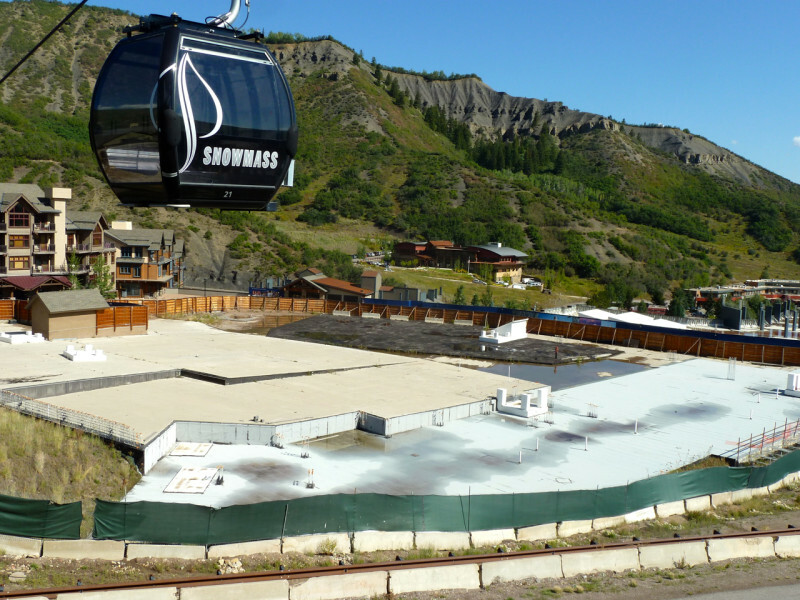 SNOWMASS VILLAGE — This fall, the most visible sign of forward progress in Base Village will come in the form of a new “sanitary sewer,” a decidedly unglamorous infrastructure improvement that will pave the way for construction of the Viceroy Hotel’s second phase by Snowmass Acquisition Co., an affiliate of Related Cos. While the public will deal with a short, but intense, period of road construction near the Snowmass Center’s main entrance, work behind the scenes continues at an even more rapid clip. 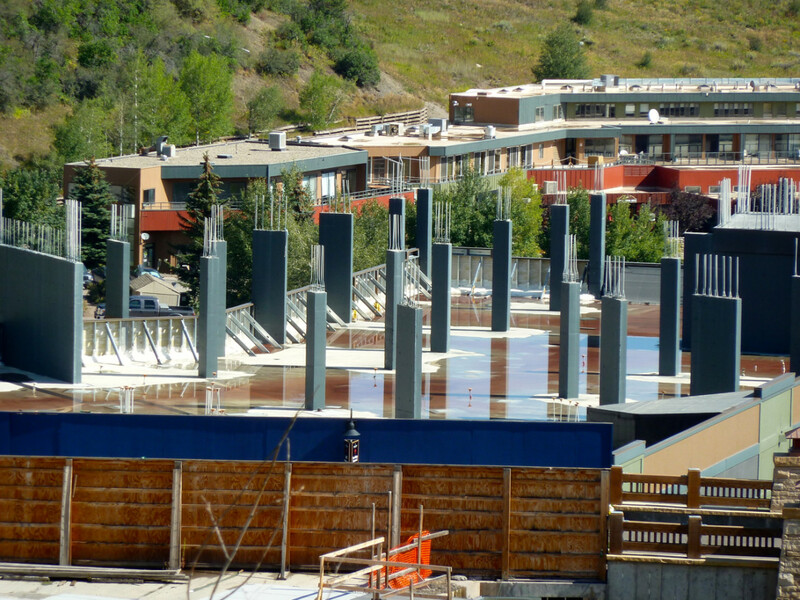 Building 8 is the partially constructed building that was to be the Little Nell-Snowmass hotel. The current Base Village developer’s “period of time,” which was originally a decade, is set to lapse in November 2014. By then, construction on Viceroy 13B, which will add 67 luxury ski-in, ski-out units to the lodging mix, should be well under way. But the faux front of the building once envisioned as a Little Nell will remain status quo until that “larger set of improvements” is outlined. The temporary facade covering an unfinished structure that was supposed to be in place for just two years is now in its third season. Back in the go-go, pre-recession days, a roundabout at Brush Creek and Wood roads (contiguous to the Conoco station) was envisioned for completion by November 2007. While that date has long since passed, the “absolute trigger” for the roundabout, as outlined in the 2004 Base Village Funding Agreement, remains unchanged, according to Jim Wahlstrom, of the town’s Community Development Department. The bridge on Wood Road was completed prior to the Viceroy Hotel’s first-phase completion; there’s still no set date for roundabout construction, though relocation of a water line (a prerequisite to the roundabout) must be finished by Oct. 15, 2016, or a security deposit will have to be posted. Performance guarantees may help repair the scars of a community bruised by the once-stalled project. Suiter, who worked as a consultant all over the Western Slope during the past 12 years, said, “Sometimes the wounds are often deeper than I anticipate.” He’s found that to be true here and in other communities. Dwayne Romero sees that changing. “In the 10 months since we have repurchased Base Village, we have met with Town Council four times, the Snowmass Village Part-time Residents Advisory Board twice and the Snowmass Homeowners’ Association once. We do believe that a large segment of the community does want to see forward progress continue in Base Village,” he said. 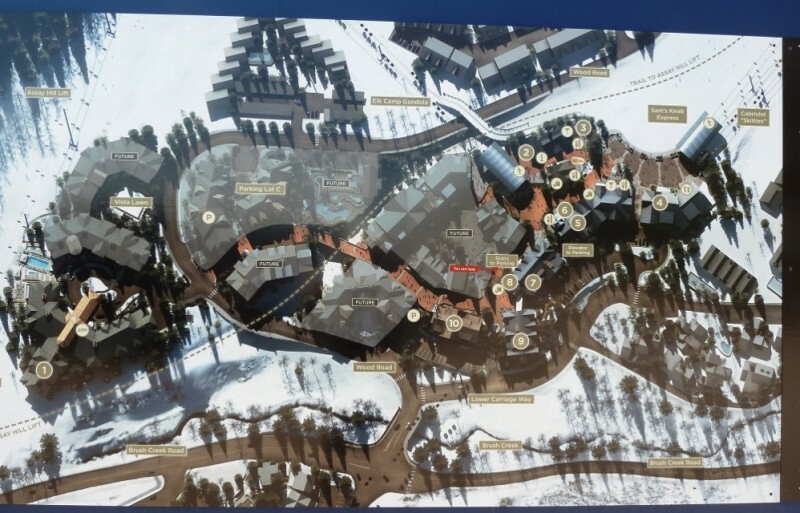 The site upon which Aspen Skiing Co. has shown interest (Building 5), where a Limelight-type hotel may be built, cannot receive a certificate of occupancy until the roundabout is substantially completed, according to the funding agreement. But that’s jumping way ahead; Skico doesn’t own the land at this time, spokesman Jeff Hanle said. “We remain interested in developing a hotel project in Base Village, but do not yet have a deal papered with Related. Until a contract is finalized, we cannot proceed with an application as we do not yet hold a legal interest in the land,” he said. The Fanny Hill Townhomes project, planned for land that Skico did retain (it sold the majority of its Base Village commercial holdings in 2007 to a partnership that included Related), is not currently in a pre-development stage, Hanle said. Myriad discussion points, including the timing of improvements to upper Wood Road, as well as potential uses for Base Village’s unbuilt sites, could be answered by year’s end, when Snowmass Acquisition Co. LLC is expected to submit a major planned-unit-development application to the town on its way forward in Base Village. In the meantime, changes continue to the partially built Base Village, including these two to the retail landscape: a new restaurant in the former Sneaky’s space and an expanded ski shop in the main floor of the Red Barn building. Editor’s note: Aspen Journalism collaborated with The Aspen Times on this story. The Times published the story on Monday, September 2, 2013.